The annual World Bank's Land and Poverty conference will present the latest research and practice on the diversity of reforms, interventions, and innovations in the land sector around the world. 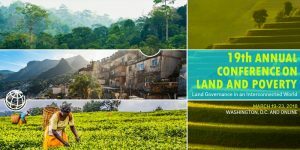 The 2018 conference theme is: Land Governance in an Interconnected World. Forest Tenure Reforms and Tenure Security: What Determines Perceptions of Tenure Security Among Members of Reform Groups? 10-09: Is There a Need to Promote Land Access by the Youth?